Fred, an ancient Mummy in the Egyptian Museum of Turin also called the Turin Mummy were embalmed 1,500 years earlier than previously thought, meaning that Fred practically predates Egyptian Pharaohs. 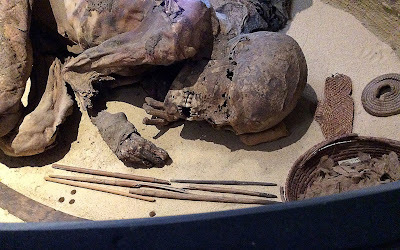 The mummy was previously thought to have been naturally preserved by desert conditions at the site where it was buried. The ancient Mummy has remained untouched by modern chemical s for thousands of years and has not been studied previously by experts. That’s until researchers from the United Kingdom decided to examining ‘Fred'. Scientists discovered what they believe is the ‘original’ recipe used do embalm mummies in ancient Egypt. Scientists performed multiple chemical analysis on the mummy which is believed to be at least 5,600 years old to decipher the formula. Dr. Jana Jones, Egyptologist and expert on ancient Egyptian burial practices from Macquarie University, said: “The examination of the Turin body makes a momentous contribution to our limited knowledge of the prehistoric period and the expansion of early mummification practices as well as providing vital, new information on this particular mummy. Scientists explain that when mixed into the oil, the resin would give the mummy antibacterial properties allowing it to be preserved and protecting the body from decay. The Turin mummy is so old that it even predates written language (the earliest known evidence of writing dates to about 3400 B.C.). So, it's likely that the embalming instructions were preserved verbally "and passed down through generations," Jones said at the briefing. Not only did the mummy confirm that prehistoric Egyptians embalmed their dead, but it also placed the procedure in more than one location: The funeral wrappings that the scientists described in 2014 were found about about 124 miles (200 kilometers) away from the spot where the Turin mummy was likely buried, Jones said. In pushing back the beginnings of Egyptian embalming by more than a millennium, the new findings offer tantalizing clues about social behavior, religious beliefs and scientific expertise in the region's prehistoric communities, Jones said.